Since the 18th century, mankind has been enjoying the fizz of carbonated and sparkling beverages. Sodas available from Serious Sips include some of the finest, high-quality sodas on the market. These sodas will make the perfect accompaniment to any dish and will work as an excellent Mixer for cocktails in your business. Serious Sips Sodas include a wide variety of flavors to please the taste buds of customers. These could be used to make and create unique cocktails made with only the finest ingredients or to enjoy on their own. Many serve as an excellent caffeine-free option. 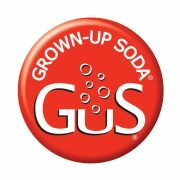 One brand, GuS (Grown up Soda), offered by Serious Sips includes a wide variety of flavored sodas produced in small batches to ensure the quality of raw ingredients. All GuS sodas are pasteurized and kosher with no caffeine and are made with no artificial colors, sweeteners or extracts. The sodas are lightly sweetened with cane sugar and are only 90-98 calories in each 12 ounce glass.